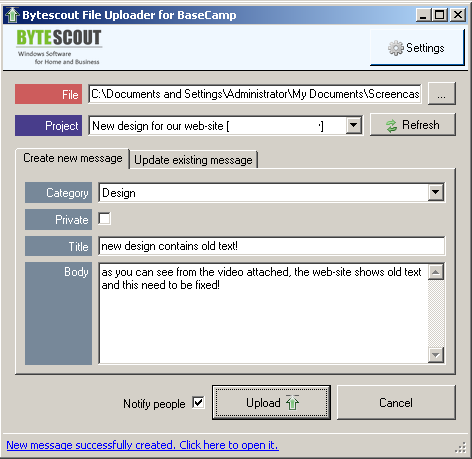 Video Bug Recorder for Basecamp is a Windows tool that records video from your screen and uploads it to your Basecamp account with just a few clicks. WHY WE HAVE DEVELOPED THIS UTILITY: Basecamp from 37signals is great for online project management tool but sometimes when you report issues or bugs with online and desktop software it is much more easier to just record a screencast from your screen instead of typing. So we've made this tool to record screencasts from your computer and upload this recorded screencast directly into a new or existing message in your BaseCamp account.